When we stepped into Pavilion at 11 am on a Friday, we went directly to El Iberico and was told that the pork ribs will only be served at 12 noon so we went to Wild Honey (an eatery that serves brunch dishes all day) to have a light bite before lunch at noon. But we ended up ordering the above two dishes and two drinks for two persons. Wild Mocha Dolce (Espresso, Chocolate, Milk, Royal Honey) - MYR16++ (10% service charge and 6% GST so it is MYR18.65 nett). The coffee here are by "Common Man Roasters" based in Singapore that also operates a cafe in TTDI, KL. 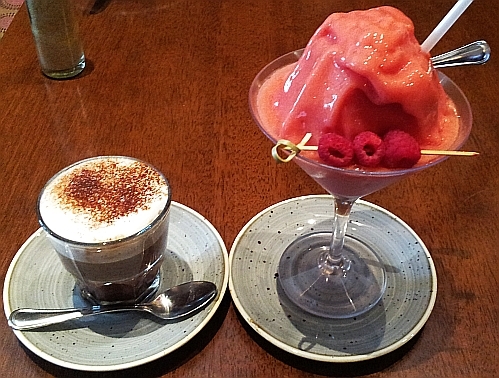 Mandarin Wilderness (Ice blended raspberry, banana, Mandarin orange with Royal Honey) - MYR20++ (MYR23.30 nett). I did not expect it to be served in such a large portion. I could not taste the slight bitterness in this drink as described by some online blog posts/articles but my friend thought that it has a bit of a cough syrup taste. I expected it to be a very refreshing drink but found that I had the wrong expectation after drinking it. All the brunch meals here are named after places. 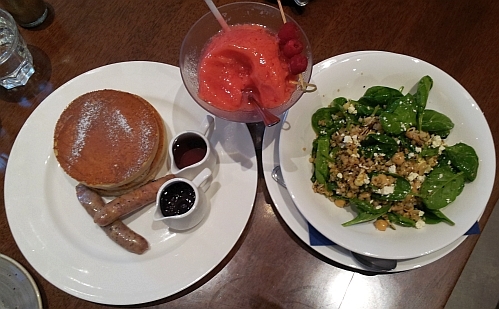 I ordered the "Canadian" dish (MYR28++ which is MYR32.65 nett) which has 3 pieces of big and thick buttermilk pancakes, Canadian maple syrup, forest berry sauce and 2 chicken sausages. 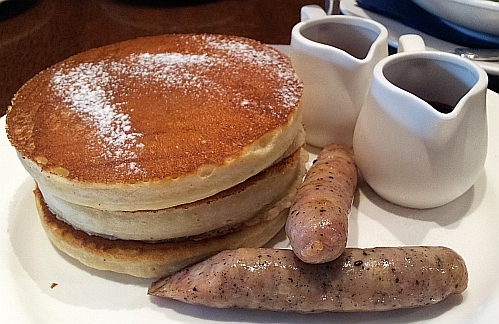 I ordered the pancakes because I wanted to compare the taste of these pancakes with the ones served by Munching Mob. The latter has a fragrant taste which is unfamiliar to me. I just want to make sure that the unfamiliar taste is not in these pancakes and it wasn't. The two of us shared one pancake and I kept the other two pieces in my trusted container. The chicken sausages taste like steamed salted chicken breast meat. Since we would be eating pork ribs later, I decided to eat some salad. 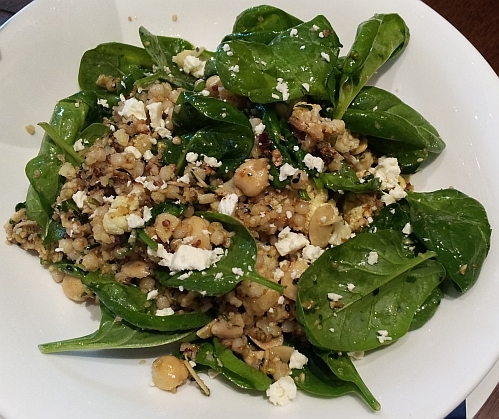 When I looked at the online menu, I have decided on the spinach and pan fried goat cheese salad but this item was not listed in the hardcopy menu in the cafe so I opted for the "Roasted cauliflower, pearl Cous Cous, toasted almonds, chick peas, Feta cheese, herbs and zataar" salad. Zataar is the generic name for a family of related Middle Eastern herbs for the same price as the pancake meal (MYR28++ which is MYR32.65 nett). I find that I like the taste of these herbs. The portion is quite large so I kept half in another container and finished the rest. 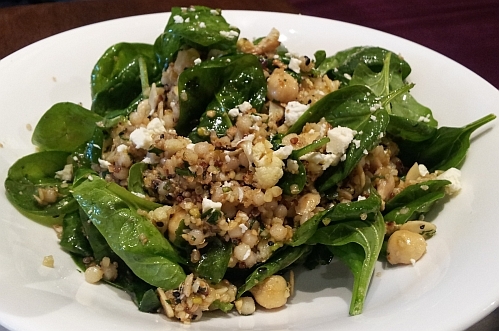 Another look at the delicious salad. I think I even tasted quinoa in it. Can you read the words in the photo above? 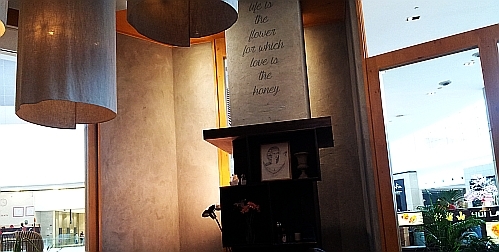 "Life is the flower for which love is the honey." 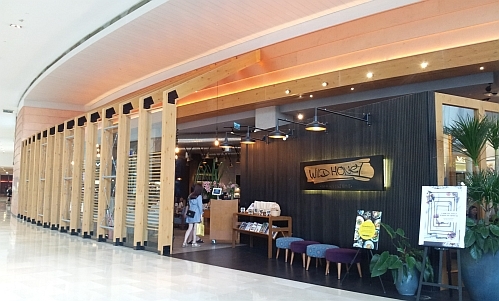 Wild Honey (since Nov 2016) is located in Pavilion where Spasso Milano (now in MyTown) used to be located. 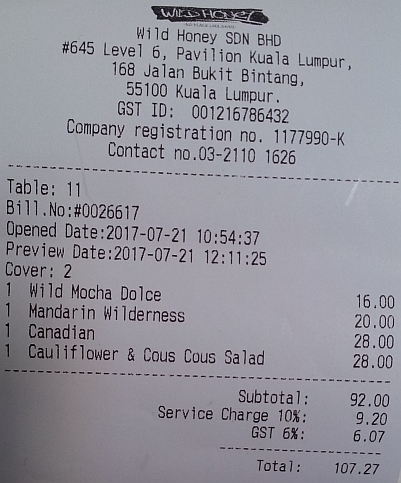 MYR107.27 nett for two persons. I did not order the more popular dishes because I do not like runny egg yolks and almost all the dishes have poached eggs or sunny side up eggs. I may be back to try some of the other dishes on special occasions. I wouldn't mind giving the Canadian a try. oh you like pancakes too. A nice brunch. My family would enjoy this!! the eatery is decorated very nicely so all of you would enjoy it! The food in this place is delicious and I like all their creative names from Wild Honey to Wild Mocha Dolce and Mandarin Wilderness! Hey, I always love to swallow the runny eggs very much! you have been to this restaurant in singapore ? the 'Canadian' dish looks good! just my type of food! The place looks nice and the food looks delicious. Have a beautiful day! the place sure is very nice! I must check out this place. I love runny eggs, so will enjoy those! you must! bring your brother! Will Wild Honey be having a branch at Gentings? hahahaa.. I love all the food above... desserts and salad as well! you can visit kl not only go gentings! What... how many containers do you bring around these days?? The Canadian would be my choice too.